Speak­er John Boehner said Sunday that the House will avoid a gov­ern­ment shut­down by passing a clean con­tinu­ing res­ol­u­tion, and he ad­ded the cham­ber will or­gan­ize a se­lect com­mit­tee to in­vest­ig­ate Planned Par­ent­hood. Boehner, speak­ing on CBS’s Face the Na­tion, said the com­mit­tees will look in­to the the prac­tices al­legedly de­pic­ted in sev­er­al un­der­cov­er videos re­leased earli­er this year, in which Planned Par­ent­hood rep­res­ent­at­ives dis­cuss the har­vest­ing of fetal tis­sue. 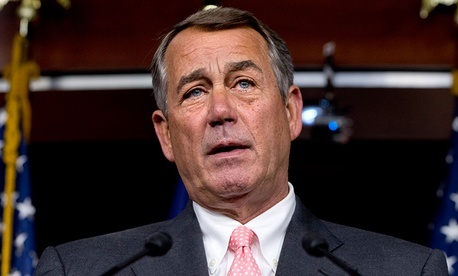 Boehner said the CR will likely need Demo­crat­ic votes to pass. Many House Re­pub­lic­ans have said they re­fuse to vote for a CR un­less it in­cludes lan­guage strip­ping Planned Par­ent­hood of its fed­er­al funds. Boehner also cri­ti­cized con­gres­sion­al con­ser­vat­ives for their un­com­prom­ising stance on a num­ber of pieces of le­gis­la­tion over the last sev­er­al years, es­pe­cially the 2013 gov­ern­ment shut­down over Obama­care. Boehner called them “un­real­ist­ic” about what can pass the House and Sen­ate and be signed by Pres­id­ent Barack Obama. Boehner an­nounced Fri­day he will resign at the end of Oc­to­ber, and he said he does not re­gret the de­cision. He said it was the right thing to do for the good of the in­sti­tu­tion, since hav­ing a vote on a mo­tion to va­cate would have caused tur­moil in the House.